When you fly, you normally get one carry-on bag and one "personal item". To maximize space and what you can pack (let me preface by saying I am a TOTAL over-packer, ha!!) I always use the biggest sized tote I can. Preferably one with lots of inside pockets and that's easy to carry! Flying takes such a toll on your skin - you lose so much hydration, feel dry and oily and gross and it's hands down the worst part of traveling by plane. I always moisturize before a flight, blot during a flight and moisturize again after a flight. It makes a huge difference! I always carry the essentials I'll need to get to in my handbag, and then the rest of my makeup in a bigger cosmetic case in my carry-on. I swear by this moisturizer to provide the freshest, most hydrating feeling ever! It's great for applying over makeup too if you just need a refresh. If you're on a long/overnight flight, consider this water replenishment face mask - it's great for dehydrated skin and it's a sheet mask so it's easy to stick on and peel off. For something calming and refreshing on your skin, I LOVE to use the Mario Badescu Facial Spray - it's sooo great for your skin, smells great and if you've been on a flight for hours and need something on your skin ASAP when you land, spray this on your face and I guarantee you'll feel 20x better! It's a must have in your bag - make sure you get the smaller version so you can bring it through TSA! 1/2. Colored Pencils & Adult Coloring Book: who doesn't love to color?! This is especially useful if you have travel anxiety - flying can be stressful, but I use this coloring book during every long flight and it's almost therapeutic how relaxing it is. 3. Wireless Headphones: preferably a noise cancelling pair, so you can listen to music or watch a movie/TV show without any disruptions! 5. Laptop Sleeve: it may sound kind of silly, but I included this laptop sleeve here rather than with my favorite bag picks because having a supportive case to rest your laptop on is *so* helpful when all you have to work with is a small pull-out tray! 1. 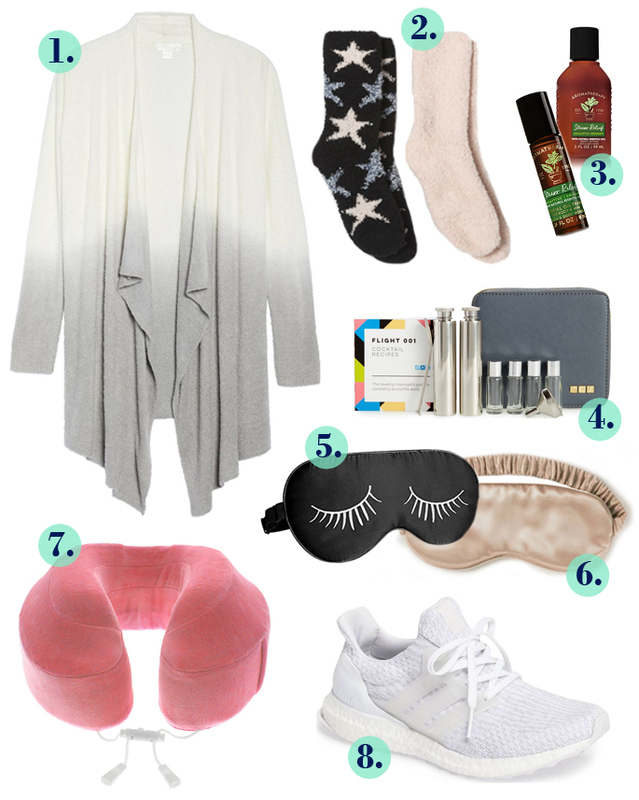 Cozy Ombre Cardigan: no matter where you're going, a cozy cardigan like this is the best thing for a flight. These Barefoot Dreams cardigans are on the expensive side, but I promise they're worth every penny! Cardigans are great because even if you're going somewhere warm, you can throw this on and off easily with a tank top underneath. 2. Fuzzy Socks: the first thing I do on a long flight is put fuzzy socks on! I'm obsessed with them - pretty sure I have my very own collection in my sock drawer - and you'll be so happy you have these on a long flight. Another option are compression socks like these - they're great to wear in-flight if your feet swell up easily! 3. Stress Relief Roller Ball & Lotion: I swear by the Stress Relief collection at Bath and Body Works! I don't know what it is but the scent is extremely relaxing, and now they have a travel sized body lotion and essential oil roller ball which is great to help you relax on your flight! 5/6. Eye Lashes Eye Mask & Silk Eye Mask: having an eye mask is one of those things you'd likely forget to pack, but wish you did. You never know who'll have their window shade opened, the overhead light on, etc. and if you just want to sleep, having your eye mask is the best way to block it all out. 8. Adidas Sneakers: these sneakers are the best for travel - comfortable and great for walking in! Especially if you have to speed walk from terminal A to D in a matter of minutes, ha! They fit well in your bag too if you need to switch them out which is an added bonus. Passport, ID, important travel papers, tickets, etc. All of the obvious must haves should always go in your handbag, in one place that you can easily access everything in a split second. With the high volume in an airport, carrying bags and trying to get to your gate on time (while most likely simultaneously juggling a Starbucks), the last thing you want to worry about is remembering where you put something or digging through your bag to find your ID. Here's some of the cutest passport cases, which are totally a necessity because staying organized when you travel is so important! This document case has become my travel document case, and I take it on every trip - it has compartments which makes carrying any sort of information you may need inside and it's VERY compact and durable. Only $14 too! Some other necessities to keep in your bag so they're handy: valuables (jewelry, nicer bags/shoes - I always keep these in my carry on and handbag vs. my checked luggage! ), medication you may need, all of your travel tickets and hotel reservation/car rental confirmations. Pro-tip: keep a copy of your passport in your checked luggage if traveling internationally, just in case! These are all great travel tips! I probably won't be getting on a plane anytime soon (sadly), but I'll have to come back to this list when I do! I have really been wanting to try out that facial spray! I keep seeing it at Ulta. I should pick it up! I definitely think comfortable sneakers and a cardigan/sweater are both MUSTS when traveling. I also agree that a little moisturizer and skin refresh make a big difference in how you feel. I don't usually pack an eye mask but on a redeye flight or for an international trip it would make a big difference. Since I am traveling in 16 days, I will definitely be bringing a few items. I am loving these travel cases. I love these ideas! I definitely need to get that facial spray. My skin always looks and feels terrible after flying. Hand sanitizer is a must too! We carry a lot of the same things in our bags! I've wanted to try that face spray for such a long time. I'm excited to see the clear Great Lash. I used to use that religiously but haven't been able to find it anywhere locally in forever. I was worried that it was discontinued! What a great list! I always forget to pack an eye pillow and I ALWAYS regret it! I can’t sleep on airplanes very well. When I'm traveling, I like to keep a book/my Kindle, some chapstick, wipes, snacks, a small jacket and my phone charger in my purse. Ooo I love adult coloring books. What a genius idea for plan rides! What a great list! I will definitely be pinning this for the next time I travel! This is a great list, definitely need to keep it in mind for my next trip! Hydration is KEY while traveling! I like your moisturizer picks! 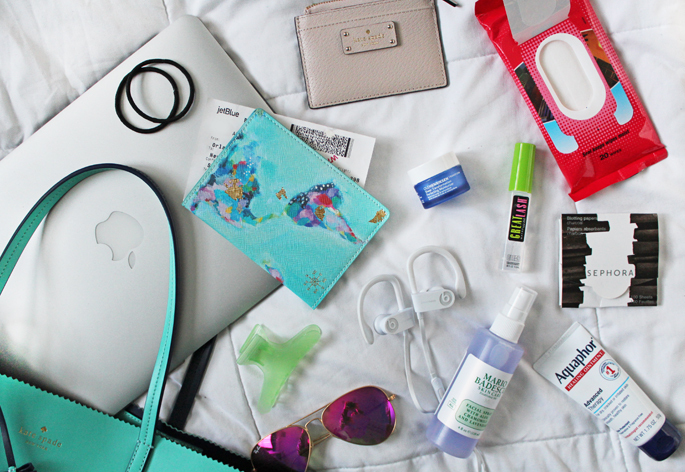 These are awesome picks babe, definitely all traveling essentials! 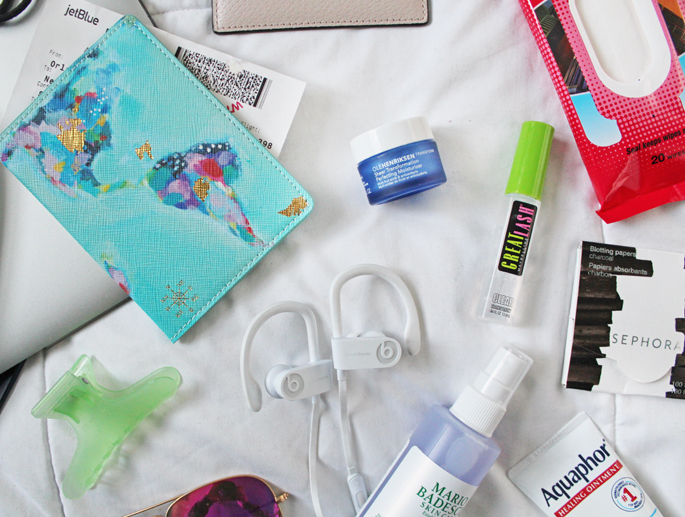 I make sure to never forget hydration while I travel, and that includes skincare! I love these tips and tricks! My husband and I are going on a cruise soon but we're flying to California to get to the cruise dock, so I'm definitely going to be packing some of these goodies! Love the idea of an adult coloring book while on the plane. That would help decrease my in-flight jitters, as well. Great tips! Loving these ideas! I always forget some of these essentials, so saving this to remind myself before our next trip. I will always remember the feeling of stepping off the plane after flying from London to NY. I was so gross and looked gross too lol. I wish I had thrown some more skincare in my bag. What an awesome list!! My skin is always dehydrated after long flights - moisturizer is a must! I LOVE that Mario badescu facial spray. This is such an amazing travel list! I love the scalloped purse and the face creams. I need to try everything else - such amazing tips! I always have my favorite moisturizer in my bag! My skin always feels so blah when traveling! This is an awesome roundup! I never remember to pack blogging papers but they're the best! Snacks and my laptop/ipod are a must for any traveling we do. 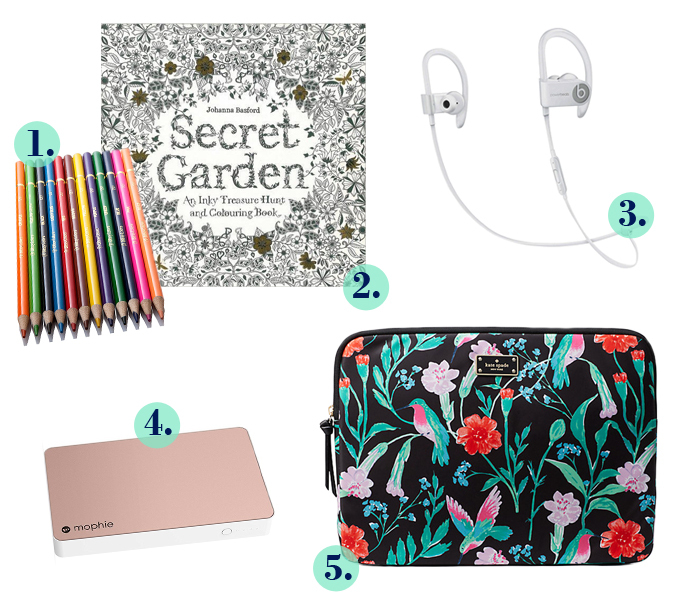 I usually try to travel only with a carry-on (less stressful, heavy and cheaper) so I would probably skip the colouring book and crayons. But otherwise... pretty much everything you mentioned finds some space in my carry-on. Snacks are definitely a must, especially when they only give you one pack of cookies on the flight haha. Loving all these ideas. Everything is so cute! I can't live without my neck pillow on planes. Great tips! These are good ideas for any trip where you will be in transit for awhile! I don't travel too often, but when I do, I always have layers - with my cardigan and a sheet mask!! My skin gets so dry after being on a plane! With a flight to Ireland coming up I will definitely be following these tips! Such a comprehensive list! Couldn’t think of a single thing more to add. My mophie case is a life saver when traveling to stay charged! I always overpack and have to end up sitting on my suitcase to zip it, ahah! I need to start scooping up some snacks from Amazon for traveling. What a great idea! Can't ever go anywhere without the wipes!! I always travel with snacks in my bag! I never want to be stuck hungry! Love your bag selection! And how cool is this night mask! I totally wish that I had brought food with me when I flew to London. Instead, I just didn't eat. I LIVE for that facial spray! I make sure to never forget hydration while I travel, and that includes skincare. Women Self Respect is very important for all women. the movement operators and corporate travel here offices (CTAs) ought to demonstrate the consolation for their wellbeing through the movement arrangements.